Indie darling Shovel Knight: Treasure Trove will soon be finishing its long post-release development cycle with one last DLC. Titled Showdown, this final bit of DLC will be a local multiplayer brawler. The game features 16 characters, including Shovel Knight, Shield Knight, the Enchantress, Black Knight, and all the Knights of the Order of No Quarter. There will be a variety of multiplayer modes for up to four players, such as free-for-all fights, co-op battles, and Gem Clash, where players fight to collect as many gems as they can. The single-player story mode is customized for each character and sees them facing rivals, participating in minigames, and engaging in an all-new final encounter. There’s more than just a new standalone game/DLC on the way. King of Cards, which lets players play as King Knight in what Yacht Club Games calls “…out biggest and most grandest singleplayer campaign yet,” will be getting a release date announcement later this week. There’s also the Treasure Trove amiibo 3-pack coming soon. Finally, Shovel Knight himself will be making a cameo as an Assist Trophy in Super Smash Bros. Ultimate when it launches December 7. 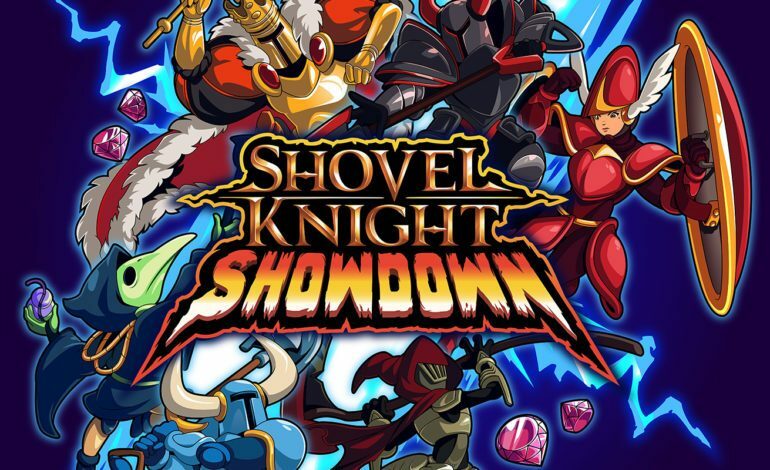 Shovel Knight: Showdown will be available on consoles and PC (sorry, 3DS and Vita users!) sometime in the future. It is available both as a standalone game and as a free update to owners of Shovel Knight: Treasure Trove.